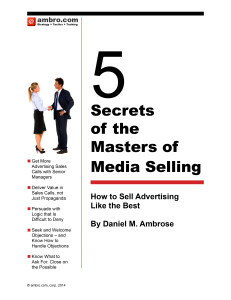 As a result many media sales managers have a very difficult time with forecasting their company’s business. Will you be up or down next month? How much business should you be forecasting for 6 months from now? Management hates surprises, so the pressure is on. The advertising sales process is particularly frustrating for inexperienced managers because the purchase-decision process at an advertiser or media-buying agency is so opaque. While one person may be identified as the “buyer” they are often not the key contact in terms of influence.